The Office of the District Attorney offers a Traffic Pretrial Diversion Program that could reduce your moving violation ticket to a non-moving violation, possibly keeping the ticket from affecting your vehicle insurance. This program is open only to those who meet certain requirements. You would not be eligible to participate if, for example, you received a ticket for any speed which is deemed excessive, or have had multiple violations in the last 2 years. Additionally, Pretrial Traffic Diversion is not available for non-payable offenses such as Driving Under the Influence or Driving Under Suspension. ATTENTION CDL DRIVERS: the Traffic Pretrial Diversion program is designed to keep a ticket from affecting your vehicle insurance. The infraction may be reported to your employer and affect your CDL points even if you complete the program. If you are interested in participating in the Traffic Pretrial Diversion program, you must complete the Traffic Pretrial Diversion request form below. THE REQUEST MUST BE SUBMITTED AT LEAST 15 DAYS PRIOR TO YOUR COURT DATE. 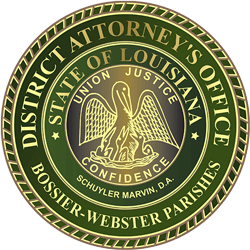 Once your request is reviewed, you will receive an email from the Bossier Parish District Attorney’s Office with further instructions. If you do not receive a response within 5 business days please contact the Traffic Diversion Coordinator at 318-965-3717. Juvenile offenders (16 years of age or younger) should contact the Juvenile Traffic Coordinator at 318-965-2332, Ext. 9. Our office must have received your ticket before any determination can be made regarding your request for enrollment in the Traffic Pretrial Diversion Program. If you have received a Pretrial Traffic Diversion acceptance letter, you may make online payments here.